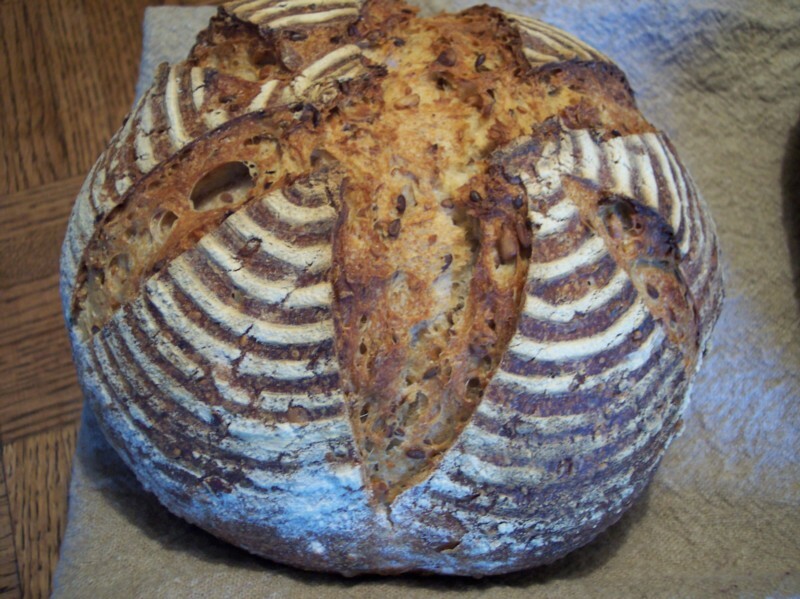 For this weeks bake I wanted a loaf that had some seeds or nuts as a component as well as one using a levain so Hamelman’s Sourdough Seed Bread seemed to fit just what I was looking for. The formula uses a liquid levain at 125% hydration for the leavening and never having used the liquid type in any previous bakes I was curious to try it out to see how it would differ from a stiff levain in terms of fermentation and flavour. The seeds that are called for are sunflower, sesame and a cold soaker of flax seeds. The one and only addition to the ingredients I made was to include some pumpkin seeds in the mix for a little more variety. All the dry seeds are given a light toasting in a 380F oven to bring out their flavour and which I’m sure adds significantly to the flavour profile as Hamelman suggests in his side note to the recipe. 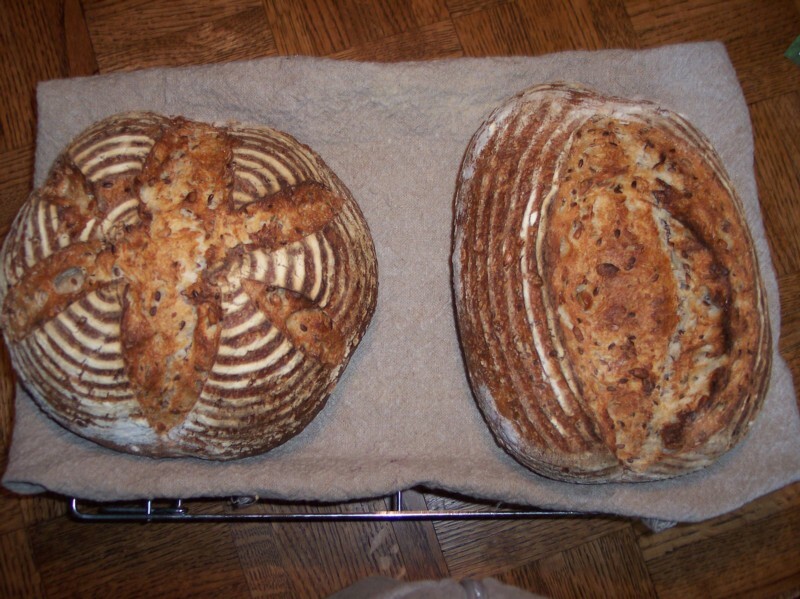 The flours used in the overall formula are bread flour @ 92% and whole rye flour @ 8% with a recommended total hydration of 75%, the water from the flax soaker contributing almost 60% of the total. Once it was time to mix I decided to use David Snyder’s method of using the paddle of a stand mixer for the first 2-3 minutes on 1st speed, and then switch to the hook for the 2nd speed mix of 7-8 minutes. This method works well to get everything combined uniformly and quickly and one I’ll use from here on. Thank you Mr. Snyder! The total weight of all the ingredients was 1.740kg which my poor old KA struggled with it at first but after I adjusted the water slightly it came together nicely requiring only a few minutes work up by hand to a medium consistency. The final dough temp was 77.2F, just a shade over the DDT of 76F then with a bulk fermentation of 3 hrs with 2 folds at 1.5 hr intervals. 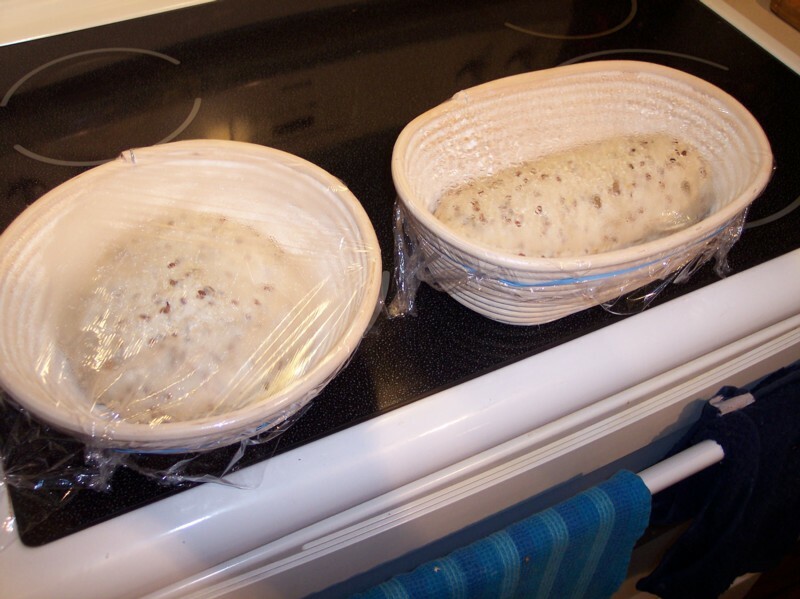 The dough was molded and placed in floured brotforms, covered and placed in the refrigerator for 15 hours at which point they came out and finished the final proof at room temp for 3 more hrs before going into a 500F oven for 8 minutes with the remaining 30 minutes of bake time at 460F. The loaf has a good crust along with a crumb structure that is open but fairly uniform, which is just the way I like it. Eaten on it’s own it has a marvelous medium sour, nutty flavour that lasts for some time after, I’m sure due to the long cold fermentation time it had. One of the aspects of this breads long fermentation that I really appreciate (besides the flavour) is that it allows me to do some other things away from the house and kitchen while it does its thing. That for me is a win-win situation that will see me using this method more often. Really beautiful loaves. I made Mark Sinclair's version of this bread today. Ended up with 3 huge loaves that are very tasty. It is one of my favorites. I used spelt and whole wheat besides the white and added some sesame and poppy seeds to the cracked wheat, oats, millet and flax just because I like them. You did a great job with yours!! They're gorgeous. Thanks for your kind words weavershouse. Your bread sounds really good, especially for the millet included in it. Millet is something I've been intending to use in a mix for a while now as I love the texture it gives to multi-grain breads. I wonder how it would take to a light toasting similar to what was done with the seeds in this bread. 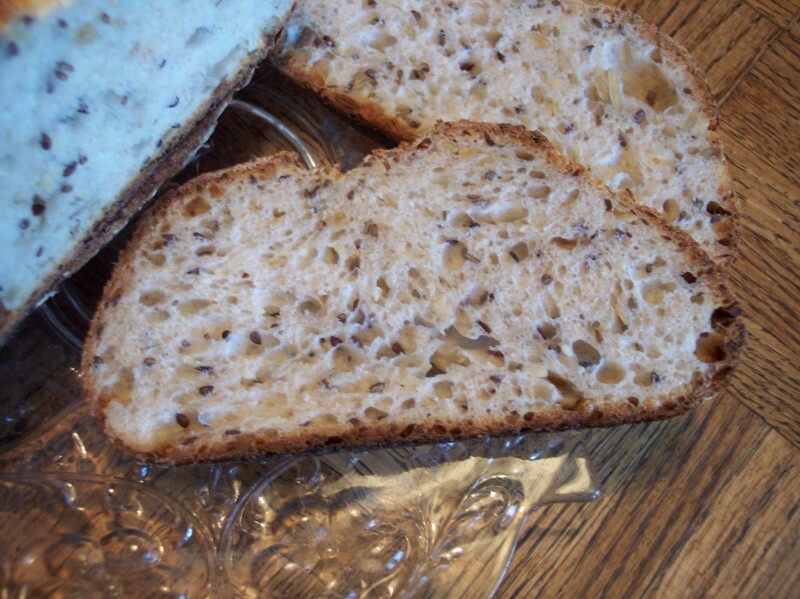 Franko, I never toasted the seeds for this bread but I wrote on my recipe to do so next time. I'm sure the millet would toast fine along with the rest. I bet toasting will add even more flavor to this bread. Next time. Thanks. I'll do this one again. That's a super looking loaf you made of this bread, thanks for sending the link. I totally agree with you about it being a keeper. I've no doubt that I'll do this one again. 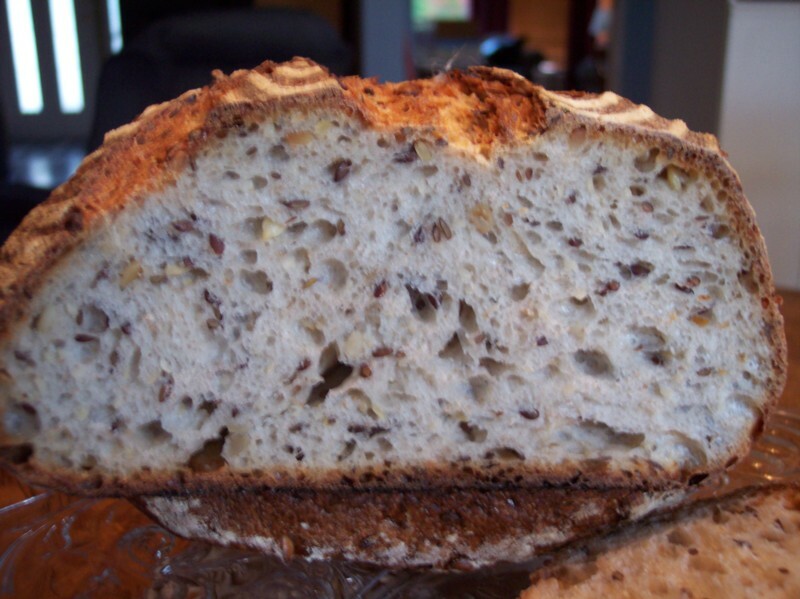 grape nut cereal as addition to sourdough ? Living in a rural area, availability of various bread ingredients is quite limited. 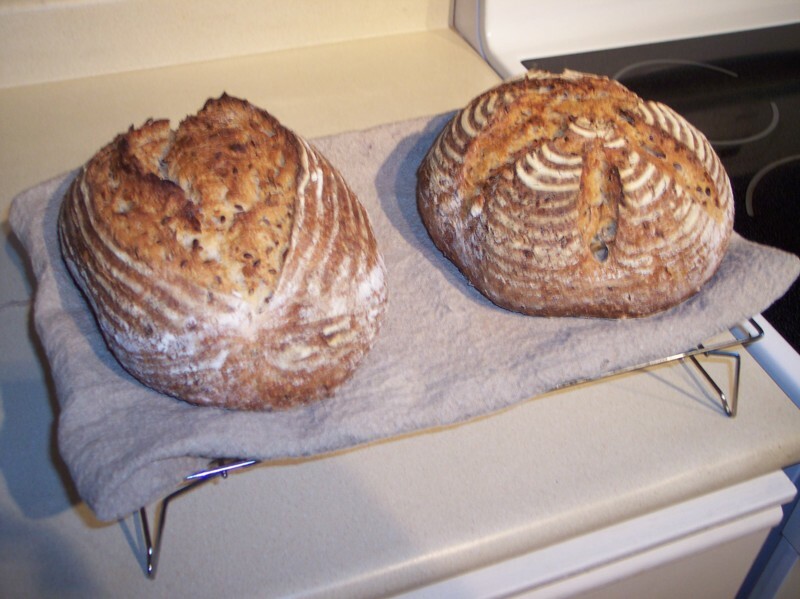 This is a delicious bread, and you made two gorgeous loaves of it. Those seeds and nuts make this a great bread for toast. I appreciate being able to consult with you before I mixed it. Good method you have of using the paddle initially. And I'm sure they tasted every bit as good as they look. As a matter of fact I just finished having a smoked ham & Swiss made with it and it was awesome! Franko, this is a wonderful attempt at a very popular formula here at TFL. I see a link already provided above; David has definitely blogged on it, and so have I. Yes, the toasted seeds are a winner, and how much water do those flax seeds take up?? Maybe thanks from all of us to Mr Hamelman for this one? Good question about the take up of the soaker . This would probably account for having to adjust the hydration during the mix. The soaker was so gelatinous by the time it was mixed I'm not sure you could accurately measure the take up. No maybe about it, Mr Hamelman created a truly great loaf with this one and deserves a lot of praise for it.